Can Continuous Diffusion of Oxygen Heal Chronic Toe Ulcers? When other modalities fail to heal chronic wounds, this author suggests that continuous diffusion of oxygen could be a viable adjunct or stand-alone therapy, and shares a few case studies from his clinical experience. The management of chronic wounds can challenge even the experienced clinician. General principles include debridement, moist wound therapy, and occlusive dressings. More specific treatments vary according to etiology. For instance, as a general rule diabetic foot ulcerations (DFU) require off-loading, while one usually employs compression therapy for venous stasis ulcers. However, skin ulcers due to peripheral arterial disease may worsen if one institutes aggressive debridement and compression therapy. Clearly, accurate diagnosis is key to proper treatment. Over the last couple of decades, a wide variety of therapies have emerged, the cost of wound care increased dramatically and wound care became a new clinical specialty. Despite important advances in new modalities like skin substitutes and growth factors and a better understanding of the wound healing process, clinicians still struggle with the “microenvironment” once a wound has become chronic (i.e., a non-healing or “stagnant wound”). The formation of biofilm, the lack of oxygen supply at a cellular level and an abnormal concentration of matrix metalloproteinases (MMPs) are all factors that can impair the natural wound healing process. Oxygen is required for the synthesis of collagen, enhancement of fibroblasts, angiogenesis, and leukocyte function. Oxygen also enhances the leukocyte bactericidal effect, including the killing of aerobic Grampositive and Gram-negative organisms, and it is cytotoxic to anaerobes. The efficacy of oxygen therapy is still somewhat under dispute, but new strategies and modalities for delivering oxygen directly to the wound bed proliferate. Recently published clinical studies have demonstrated significantly positive effects using diffusion of oxygen therapy.1-3 The positive effects include faster wound closure, improved wound closure success rate, pain reduction, reduction in methicillin resistant Staphylococcus aureus (MRSA) infection, increased vascular endothelial growth factor (VEGF) expression and angiogenesis, and reduced venous stasis recurrence. (EO2 Concepts®), which generates and delivers oxygen directly and continuously into a chronic non-healing wound environment. This device monitors and adjusts for flow and pressure, and allows for full patient mobility. While the underlying concept of the device is being established, the manner of oxygen the device provides is novel, unique, and worthy of clinical consideration. Wounds that I have treated successfully thus far with continuous diffusion of oxygen include venous stasis ulcers, pressure ulcers, diabetic foot ulcers and gangrenous ulcers. I have also found the modality beneficial for wound bed preparation for skin grafting, full- and split- thickness skin grafts, radiation burns, dehiscent surgical wounds, and diabetic amputation wounds among others. The device and technology are safe. There are no known risks to the patient and there are currently no reported adverse effects or reactions associated with the use of continuous diffusion of oxygen therapy in the literature. oxygen delivery system in the treatment of toe ulcerations. The patients in the study received continuous diffusion of oxygen therapy at rates between 3 and 10 mL/hr underneath a moisture balancing dressing, and clinicians attempted to use compression when appropriate. Initially, the treating physicians placed the oxygen delivery cannula in the wound bed and covered the cannula with either calcium alginate, hydrocolloid and/or a foam dressing. They subsequently used the integrated OxySpur® Oxygen Diffusion Dressing (EO2 Concepts®). This dressing integrates the oxygen delivery cannula into a multilayer moist wound therapy dressing. Patients or caregivers change dressings as needed with physician visits approximately every week. I would like to share several cases that are representative of my experience with continuous diffusion of oxygen therapy in general. Common patient characteristics in the presented cases include advanced age of patient, abnormal creatinine levels (>2.5), and severe peripheral vascular disease resulting in chronic critical limb ischemia (CLI), which is associated with great loss of both limb and life.8 Prior to the use of continuous diffusion of oxygen, all patients had minimal digital amputation even though their predicted wound healing potential — based on non-invasive tests, such as ankle brachial indices (ABI), transcutaneous oxygen pressure (TcPO2) and Doppler waveform — were low. All the patients had hard-to-heal wounds that failed standard therapy. These patients were not candidates for revascularization and were unwilling to undergo a higher level of amputation. While I was hesitant at first due to the lack of robust medical literature supporting continuous diffusion of oxygen therapy, I decided to try it for these patients. I quickly witnessed changes in the wounds and in a relatively short time (several weeks) came to appreciate the potential of this new therapy. The outcomes ratified my early impressions. A 55-year-old African-American female presented with a diabetic neuropathic foot ulcer with ischemia and infection. The patient had a history of type 2 diabetes, chronic kidney disease with dialysis, hypertension, dyslipidemia, peripheral arterial disease, DFU cellulitis, and osteomyelitis. Previous treatments included systemic and local antibiotics, surgical debridement including digital amputation, local wound care, and moist wound occlusive therapy. I initially saw the patient in May 2013 for new blisters on the left foot. She developed the blisters two weeks prior to her visit. The blisters appeared spontaneously and had mild drainage. The patient denied having any trauma and had been applying Silvadene to the area. The initial exam showed swelling of the 4th and 5th toes. Using a pocket Doppler, I noted the right pedal pulses were weak and monophasic with the posterior tibial and dorsalis pedis pulses. The ABI was 1.2 bilaterally. The toe brachial index (TBI) on the left leg was abnormal. Two weeks later, the patient developed dry gangrene on the distal phalanges of the fourth and fifth toes. She was not a candidate for revascularization. An orthopedic surgeon had suggested a below-knee amputation (BKA) but the patient declined and opted for a more conservative wound care treatment. I performed digital amputation of the fourth and fifth toes. A month later, she developed an abscess and osteomyelitis of the middle phalanx of the fourth and fifth toes of the left foot. The healing process was very laborious and slow.
. During the initial two weeks of continuous diffusion of oxygen therapy, there was an increase in drainage. After the third week, healthy granulation tissue was visible. The wound was completely healed after eight weeks. As of the last visit, the patient was doing well and has not had a recurrence. Figure 1. Case Study One: Photos Immediately Prior to Initiation of CDO Treatment (A), during treatment (B) and Follow Up After Treatment with CDO (C). A 77-year-old African American male presented with a non-healing ulcer on the fourth toe and on the great toe of the left foot. The patient has a history of type 2 diabetes, chronic kidney disease, hypertension and dyslipidemia. I saw the patient for a two-month-old ulcer on the left great toe. The ulcer appeared after a podiatrist performed a toenail removal. The patient subsequently developed another wound on the fourth toe of the left foot. Both wounds were worsening. He was using Silvadene without much improvement. The right ABI was 0.94 and the left ABI was 1.2. The patient’s progress was slow. After three months, he started on continuous diffusion of oxygen therapy. Healing began gradually and after six weeks, the wound was completely healed. Further follow-up visits showed continued improvement. I ordered low compression hoses due to mild to moderate leg edema. The patient did well without complications. Figure 2. Case Study 2: Photos Immediately Prior to Initiation of CDO Treatment (A,B), During (C) and After Treatment with CDO (D). An 85-year-old Caucasian female presented with a right foot cellulitis and blue discoloration in the second toe. She had a history of type 2 diabetes, anemia, diabetic foot ulcers, peripheral vascular disease following a BKA and cellulitis. I first saw the patient in April 2013. Due to a previous contralateral amputation, the patient was afraid to lose the other leg. Her right pedal pulses were poor and trophic changes of the skin were present. She was afebrile, did not have chills and had normal blood pressure. The patient’s erythema improved after a week of oral antibiotics. However, I did have to amputate the second toe as it had become gangrenous (secondary to cellulitis and peripheral arterial disease) with an ABI of 0.6 and monophasic and weak pulses. The wound healed by secondary intention. A couple of months later, the patient developed a wound on the tip of the big toe. However, her elevated creatinine level and advanced age precluded an angiogram, further vascularization and higher-level amputation. The patient’s second wound on the big toe was slow to heal. After trying different treatments including enzymatic debridement (Santyl, Smith and Nephew) and standard occlusive dressing, I decided to use continuous diffusion of oxygen. Four weeks later, granulation tissues were evident and in a matter of two months, the wound was completely epithelialized. Figure 3. Case Study Three: Photos Immediately Prior to Initiation of CDO Treatment (A), During (B) and After Treatment with CDO (C). In using continuous diffusion of oxygen treatment for chronic toe ulcers that have failed other standards of care, my colleagues and I have experienced a closure rate of 74 percent in an average of 65 days for wounds that were open for 153 days on average. These results compare favorably to the continuous diffusion of oxygen (CDO) registry (Table 1) that is maintained by the manufacturer, EO2 Concepts® (www.eo2.com). The registry contains real-world clinical outcomes that are classified as being either a Success (defined as therapy goals met or fully healed and closed) or a Failure (defined as removed for other reasons). 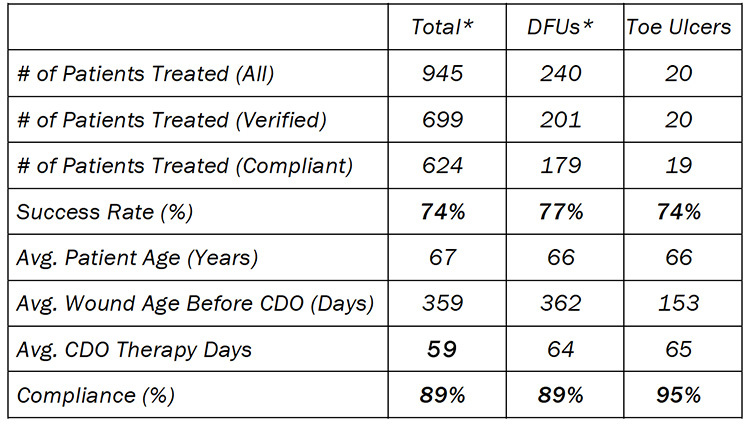 The percentage of patients healed, CDO therapy time, and compliance rates are all very similar. These outcomes are relevant and similar in that most wounds treated had already been treated with other advanced wound therapies, such as HBO therapy, negative pressure wound therapy, skin grafting, antibiotic treatment, etc. 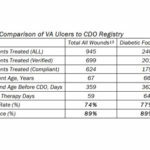 The majority of wounds were unresponsive to other advanced wound therapies prior to treatment with CDO therapy. is a good option— either by itself or adjunctive to other therapies—in the treatment of chronic wounds. The majority of wounds were unresponsive to other advanced wound have used it on a broad spectrum of difficult or unresponsive wounds, including the toe ulcers discussed here, and was able to heal approximately 74 percent of the cases. Since continuous diffusion of oxygen is a relatively new technology, we are still gaining experience in its application. Typical progression of the wound is an initial reddening accompanied by increased exudate in the first few days. The increased exudate would typically last a week to several weeks before returning to normal. In some patients, the increased amount of fluid caused some discomfort, but never resulted in any serious reactions or complications. The OxySpur® dressing was very easy to apply and remove. This enables one to easily check the wound and its progress while allowing for patients to easily change their own dressings. A chief benefit of the therapy is patient adherence, which was very high, most likely because of the device’s ease of use, the noticeability of improvement within a short period of time and the reduction of pain. A number of patients reported reduced pain and that distinguishes continuous diffusion of oxygen from therapies like NPWT, which can induce pain. The return of sensation (including itching) also occurred and this indicates healing progression. In fact, even one neuropathic patient reported a return of sensation. Finally, patients reported the system to be more convenient than other systems and particularly liked that the device is silent and allows for mobility. Considering the very positive results in unresponsive, chronic wounds along with the convenience, ease of use, portability and the resulting improvement in adherence, one should consider continuous diffusion of oxygen as a first-line treatment for chronic wounds. oxygen delivery system may be appropriate not just in the clinical scenarios I have described in the aforementioned case studies but also as a first-line treatment for other chronic wounds. There is an emerging body of credible clinical evidence for this modality and I look forward to seeing further research into the mechanisms of action and potential uses. Overall, the patients reported the system to be more convenient than other systems and particularly liked that the device is silent and allows for mobility. 1. Gordillo GM, Roy S, Khanna S, Schlanger R, Khandelwal S, Phillips G, Sen CK. Topical Oxygen Therapy Induces VEGF Expression and Improves Closure of Clinically Presented Chronic Wounds. Clin Exp Pharmacol Physiol.2008;35:957-964. 2. Tawfick W, Sultan S. Does Topical Wound Oxygen (TWO2) Offer an Improved Outcome Over Conventional Compression Dressings (CCD) in the Management of Refractory Venous Ulcers (RVU)? A Parallel Observational Comparative Study. Eur J Vasc Endovasc Surg.2009;38(1): 125-32. 3. Blackman E, Moore C, Hyatt J, Railton R, Frye C. Topical Wound Oxygen Therapy in the Treatment of Severe Diabetic Foot Ulcers: A Prospective Controlled Study. Ostomy Wound Manage.2010;56(6): 24-31. 4. Sen CK. Wound Healing Essentials: Let There Be Oxygen. Wound Rep Reg.2009;17:1–18. 5. Gordillo GM, Sen CK. Evidence-Based Recommendations for the Use of Topical Oxygen Therapy in the Treatment of Lower Extremity Wounds. Intl J Lower Extremity Wounds.2009; 8:105-111. 6. Schreml S, Szeimies RM, Prantl L, Karrer S, Landthaler M, Babilas P. Oxygen in Acute and Chronic Wound Healing. British J Dermatology.2010;163:257-268. 7. Niederauer MQ, Michalek JE, Armstrong DG. Interim results for a prospective, randomized, double-blind multicenter study comparing continuous diffusion of oxygen therapy to standard moist wound therapy in the treatment of diabetic foot ulcers. Wound Med. 2015; 8(1):19-23. 8. Winfield, B. Topical Oxygen and Hyperbaric Oxygen Therapy Use and Healing Rates in Diabetic Foot Ulcers. Wounds.2014; 26(5):E39-E47. Does Continuous Diffusion Of Oxygen Have Potential In Chronic Diabetic Foot Ulcers?